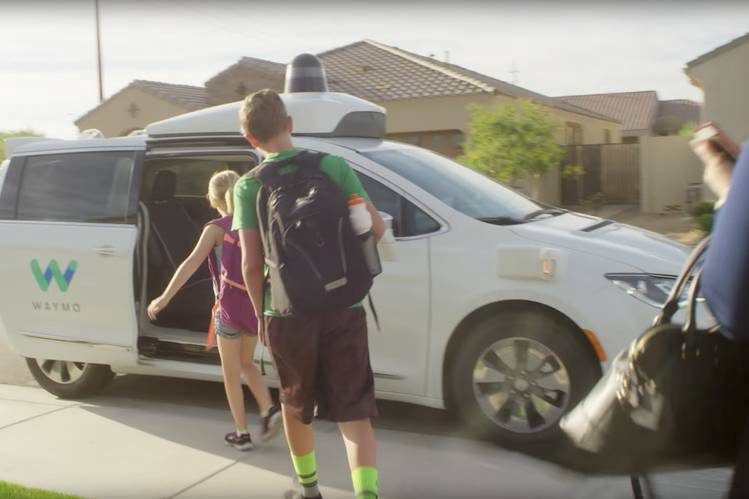 This entry was posted on Thursday, June 22nd, 2017 at 10:29 amand is filed under Other.You can follow any comments to this entry through the RSS 2.0 feed.You can skip to the end and leave a comment. Pinging is currently not allowed. Your website may be beautiful, but if it’s not generating and capturing leads, it’s not functional. In fact, you may be downright invisible to prospects. It may be time to hire an SEO, a Search Engine Optimizer, who can give your website a much needed boost in visibility. We’re living in a digital world. With so much content available online, the internet is the first place we go if we want to do research, find an answer to a question or make a purchase – even if that purchase is buying a house. While a new homebuyer isn’t about to do the entire purchasing transaction online, they are likely to start searching the web for listings in their area and price range. This means by the time they connect with a real estate agent, they’ve already considered what they can afford, what they’d like to purchase and what homes they want to take a look at. But that isn’t all. They also know which real estate agents they’d like to work with – before even making a phone call or talking to you in person. They’re using the information they’ve gathered online to make a decision. If you’re not accessible or visible online, you’ll have a harder time being part of the running. An SEO, or a search engine optimizer, will be able to help you become more visible in online searches. But not all SEOs will give you the same outcome. If you want to beat out your competition and get the high-quality clients, you need a high-quality SEO. SEO, or Search Engine Optimization, is a digital marketing tactic that allows you to improve your search engine ranking. By working with the algorithm that determines where each page falls on the search engine results list, you can boost your website so it reaches the first page of the results. The higher your ranking, the more likely you are to get selected by a searcher. SERP stands for Search Engine Results Page. Your goal is to appear on page one when a user types in a query that matches your products or services. SEO strategies work by looking at a search engine algorithm and working backward to fit the algorithm’s needs. To create an SEO strategy, consider the various things a search engine is looking for when it decides how to rank relevant pages. Then, make sure your website aligns. While this may sound simple, search engines are constantly changing their algorithms, making it difficult for non-experts to keep up. SEO isn’t something you can ignore. When homebuyers are looking for valuable information online before ever picking up the phone, you want to make sure your content is reaching their eyes before they make a decision on which real estate agent to work with. The right SEO strategy can help you do this. While you may be an expert at selling houses, the same strategies don’t apply to digital marketing. Hiring an SEO isn’t enough to bring your website to the front page of a search. Getting to the top means you need to have a strong online presence all around. This includes content creation, website design, and even social media. The right SEO should be able to provide insights and guidance on what you can do overall to improve your website and user experience. When you’re hiring an SEO to work on your real estate website, you’re not hiring an employee – you’re hiring a professional service provider. This means that the ball is not entirely in your court. Both you and the SEO need to agree you’re a good fit for one another. 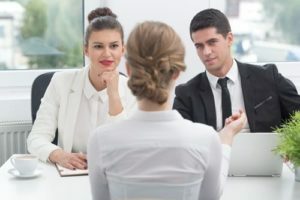 By holding a two-way interview, both you and the SEO can get a good idea of how you’d work together. Both parties should be prepared to ask and answer questions, including the basics about budget, timeframe, and goals. You’ll also want to get into more in-depth questions and ask for references, examples of past work, and what benefit they can bring to your business. Ask what experience they have working with real estate websites specifically. Prepare with answers of your own. Know what you hope to accomplish with an SEO strategy, what your expectations for the partnership are, and what direction you’re hoping to go in. Have an idea of what your budget is, what work you’d like to have done, and what kind of returns you’re hoping to see. Be prepared to sell yourself to the SEO just as much as they need to sell their services to you. If an SEO candidate has made it through the two-way interview, you’re ready to move on to the audit portion. Because an audit of your website requires extensive time and research, be prepared to pay a fee for an SEO to complete this step. However, the information will be crucial for moving forward in your SEO strategy creation. By looking through your Google Analytics and search factors, an SEO can determine the main issues with your website and what areas can be improved. They can then use this information to make suggestions on what they would do if you were to hire them for the project. 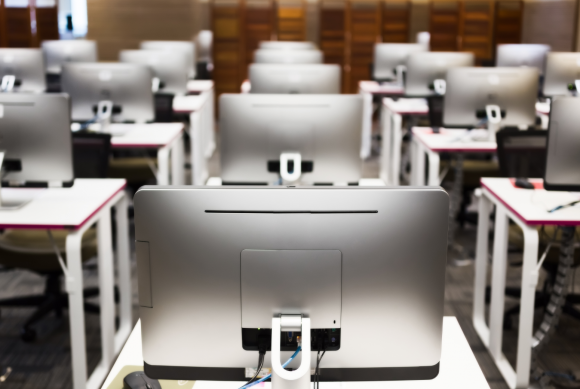 Be sure that their audit report includes issues, suggested improvements, the cost for the service, how solving this issue will improve your business, and what they will do if the first plan of attack doesn’t work. By getting a complete guide from your SEO, you can ensure they’re prepared and fully understand what they’re doing. Results from an SEO will not be immediate, but that doesn’t mean they’re not working. In fact, organic SEO results take time to manifest. Depending on the work you’ve already done, your level of competition, and where your site was originally ranking, it could take up to a year to really see results from your SEO strategy. However, many websites see an improvement in just a few months. Don’t set both yourself and your SEO up for failure by asking for immediate results. Rushing, implementing practices meant to “trick” the algorithm, or creating unrealistic goals for your strategy will only waste your time and money. When talking with an SEO you’re considering hiring, ask them to provide you with a realistic timeline for the work they will be doing. This timeline should also consider the amount of time it will take to create content, update the design of the website, and add keywords and descriptions to past pages and posts. The thought of potentially waiting a year to see results from your SEO strategy is intimidating for many, but laying a solid foundation means you’ll need to make fewer changes in the future. But it also means you may not know for months that something is off or that a keyword isn’t as strong as you thought. To help ensure you’re moving in the right direction, seek out articles, guides, or other materials that explain basic search engine strategies. Educate yourself on what’s standard practice in SEO. The goal is not necessarily to learn the intricate details, but to be wise enough gauge your expectations. Even if you don’t know the first thing about SEO, don’t allow yourself to be fooled by someone only pretending to know what they’re doing. You may also enjoy: Should Real Estate Agents Invest in SEO? We like to have guarantees that we’ll get what we want when we make a purchase. But just like you can’t guarantee you’ll find a client’s dream home within their budget in the perfect location, an SEO can’t guarantee you the prime real estate of the number-one ranking on Google. If an SEO is guaranteeing you a top slot, this can be a major red flag. Because search engine results pages are controlled by an algorithm, there is really no way to determine exactly which page will make it to the top. While SEOs are experts in nudging the algorithm to get it to place pages in higher slots, even the best SEO available can’t guarantee it will get your link to the top. If an SEO is guaranteeing things they can’t promise, they’re probably lying elsewhere. Rather than taking the risk and wondering what else they may be trying to hide from you, find an SEO with more trustworthy tactics. Few things are more annoying than hiring someone to do a job and then never being able to get in contact with them. Before you pay an SEO any money, talk to them about your expectations for communication and project approval. Make sure you know their expectations as well. Don’t be afraid to get picky about how you communicate with your SEO. 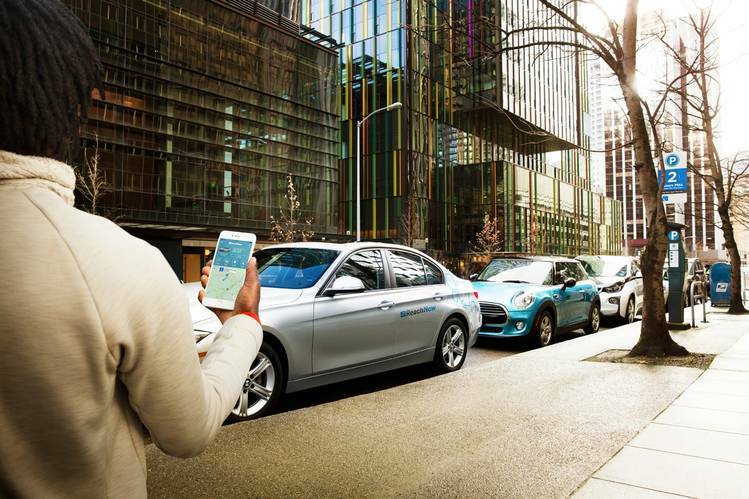 As a busy person always on the go, you need someone who can fit within your lifestyle. If you want someone you can text between meetings with a question or someone who isn’t afraid to call your cell phone, be sure your SEO knows this. Also be sure to talk about an update schedule. Because most of what your SEO is doing day-to-day won’t intertwine with what you’re doing day-to-day, you may go weeks without ever speaking to your SEO. Be sure to set up an update schedule so you and your SEO know when to get in touch to talk progress. You may also enjoy: SEO vs. SEM, What’s the Difference? The final step of the hiring process is payment. Once you’ve selected the SEO you believe can help your real estate website and decided on the appropriate measures to take, take some time to discuss the SEO’s payment terms, fees, and invoice schedules. While you probably got an idea of costs with the audit your SEO performed early in your relationship, now is the time to really hammer out the contract. Outline if you’re paying by project, by the hour, or by a monthly retainer. Include invoice due dates, details related to late payments, and what either party should do if the other end is not holding up their end of the contract. If your SEO is creating and sending you the contract, be sure to read the details thoroughly. As a legally binding document, you want to know exactly what you’re agreeing to. If anything stands out as being incorrect or something you hadn’t discussed, don’t hesitate to ask them what it means. A B.R.E.W. is a Ballen Real Estate Website. The idea for Ballen Real Estate Websites came from the pain-points of real estate agent turned digital marketer, Lori Ballen. Lori’s success at marketing her own real estate business online led to the launch of her digital marketing company, Ballen Brands. Although Lori and her marketing team were knocking it out of the park with things like lead generating, lead nurturing, lead capture, and search engine optimization, she was still struggling with how to create “the perfect” real estate website. She and her team then invested all of their energies into brainstorming. In Lori’s idea, real estate websites should be imbued from the ground up with search engine optimization, then enhanced with content marketing strategies for organic ranking and lead generation, tools for lead capture, tracking and measuring systems, and more. In short, her goal was to create a website for real estate agents that was functional for business growth. Search engine optimization is a complicated subject, especially for those not in the marketing world. 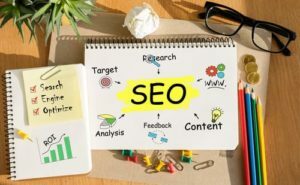 For real estate agents looking to improve their online ranking and get their website found, using a professional SEO to help you create the right strategy can be career changing – but you want to be sure you’re using an SEO that understands what they’re doing. Getting the right SEO strategy is an investment that will pay you back many times over. 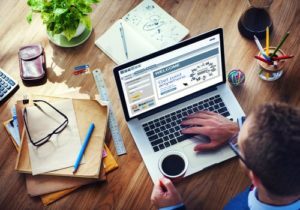 Be sure to follow these eight steps in finding and hiring the right SEO for your real estate website. It’s the season of giving, and I have another great FREE resource for you today. It’s the “SEO Keyword Bible for Investors”. This is an enormously useful resource for investors. When you click on the link below to get your free copy of the “SEO Keyword Bible for Investors”, it will take you to a page that has several short videos. Don’t be tempted to skip over the videos. These videos will explain in great detail how to use this free resource no matter what type of website you have. This information isn’t just for Oncarrot websites so take a little time and dive into those videos. You will find it’s beneficial no matter what type of website you have. In video #2, you will find a lot more actionable information Here is just a taste of what you will learn starting with the “3 C’s for Conversion”. 1. Cell phone conversion. 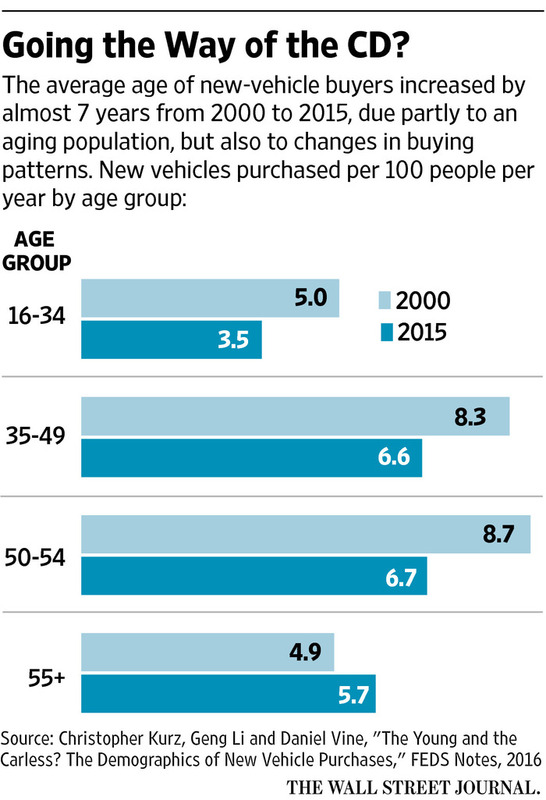 You need to pay attention to mobile. Over 21% of the Oncarrot leads came from cell phones. In this video you will also learn you why your conversion rate is higher on mobile. Now that’s interesting. 3. Credibility Boosters. In this part of video #2, you will learn “10 things people are looking for on a website to determine if they want to work with you”. You don’t want potential sellers to leave your site based on a bad first impression of your site. One last tip. Don’t forget to add testimonials from satisfied customers. If you don’t have a website or you need a better lead generation website, you can see a demo of the sites I use (and love) right here. Once again …. no obligation. Just check it out. “Search Engine Optimization” the term alone is scary. Let’s be honest, it sounds like a complicated mathematical process that only “experts” can understand. SEO specialists are the wizards of digital marketing. They throw complicated words around, talk about legendary search algorithms and technical HTML terms. Truth be told, take away the fancy hat, the cape and the wand and you’ll soon realize, there is nothing magical about it! In this step by step guide I will show you exactly what you have to do to optimize your search engine ranking and therefore attract more leads to your real estate business. Google Search Console (previously called Google Webmaster Tools) is your website’s SEO dashboard. It is a free web service that Google provides to help you monitor your indexing status and optimize the visibility of your website. The first thing you want to do on your quest for SEO greatness is to add and verify your website on Google Search Console. Shortly after doing so, you will receive an e-mail from Google with suggestions to improve your website’s search presence (don’t worry, we’ll go over the important tasks with you). 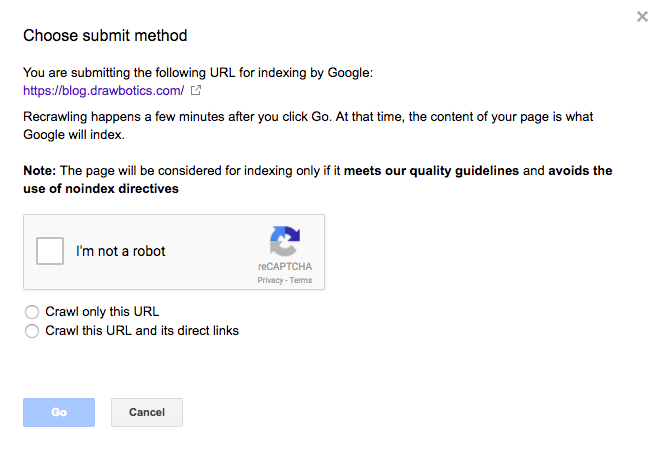 If you want to know more about Google Search Console, I recommend reading this article on the Moz Blog. Although it was written almost 2 years ago, most of the content is still relevant today and very easy to go through. If you created your site with a website builder like Weebly or Wix, your sitemap will be generated automatically. All you have to do is add “/sitemap.xml” to your website’s URL. If this isn’t the case, you can generate one for free with a tool like xml-sitemaps.com. Next, you have to submit your sitemap on Google Search Console. To do so, simply click on the “Sitemaps” tab under the “Crawl” category. Click on the “Add/Test Sitemap” button, fill in the blank with the url corresponding to your sitemap and hit submit. 3) Make sure your website is indexed. Whether you just launched your website, created new pages or made significant changes, you are going to have to request an indexation of all this new content. On the left hand side of your screen you will find different categories. Select the “Crawl” category and click on the tab “Fetch as Google”. You will be able to request the indexation of all the pages of your website. Start with the home page. To do so, no need to edit the existing url, simply click on the “fetch” button. If the status is “Complete” you can request indexing. A window will pop up asking you whether you want Google to crawl only that page, or also crawl all its direct links. I recommend (for the home page at least) choosing the second option. The latter will enable you to index your whole website automatically. Google will send its robots to crawl your page and fetch all the information. Changes should be accounted for within the next few days. The titles of your pages are extremely important for your SEO. I cannot stress that enough. Luckily, on most website builders they are very easy to change. Once you’ve answered both, finding the right titles for your pages will be very easy. Let’s go through the process together. 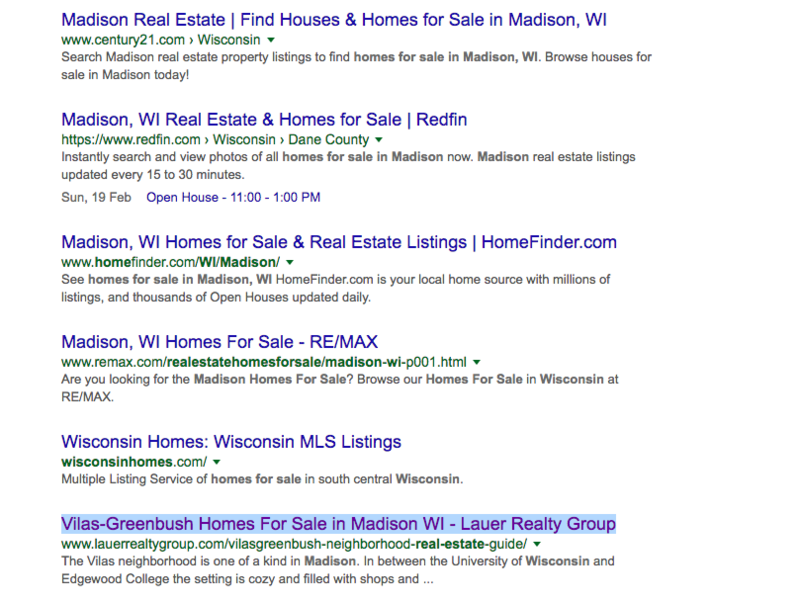 For the sake of this article, let’s imagine I am a realtor in Madison, WI. Step 1: What is the web page about? This page is all about the homes you are selling. You want to make sure that the title reflects the content of the page. 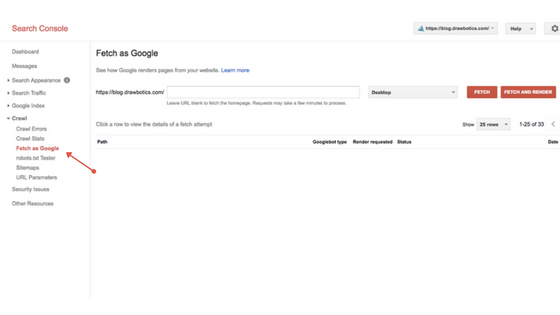 Trust me, there is no point in trying to trick Google with title pages that do not match the content of your website. First of all, it will simply not work. Secondly, you will be flagged and your SEO efforts will be useless. 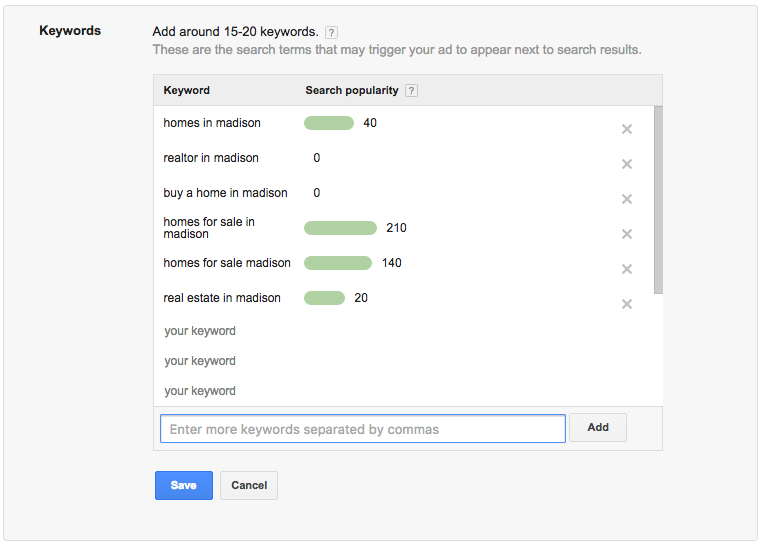 What are people typing in Google when they want to find a new home in Madison or the best realtor in town? You can’t know for sure, but you can make an educated guess. It will be impossible to compete for those keywords. Too many websites are already targeting them. The goal is not to attract as many people as possible on your website. The goal is rather to attract quality leads. Using a tool like Google Keyword Planner will enable you to check the popularity of certain keywords. In this example, “Homes for sale in Madison”, seems to be a good fit for our listings page. Step 3: Check your competitors. Like in any fight, it’s good to know who you are going up against. I recommend doing a search for the keywords you selected. In this case, we are going up against large real estate companies like Century 21 or ReMax. But that doesn’t mean it’s impossible to rank on the first page! They are doing a pretty good job, but we can definitely do better! Don’t add too many irregular characters. Keep it simple and don’t use technical jargon. It has to be easily understandable for your visitors. Step 5: Finding the perfect title. I came up with an example to show you a title that takes into account everything we previously discussed. 5) Meta descriptions that convert. A meta description is a short text (of approximately 160 characters) that provides a concise description about the contents of a web page. Meta descriptions do not affect the ranking of a specific webpage on a search engine. But, as the title suggests, a good meta description is critical to ensure people click on your link. Let’s go back to the previous example I used. As you can see the meta descriptions of these 3 pages are very different. Let me ask you a question: Which link would you click on? The first one right? The reason is simple: it follows the basic guidelines of a perfect meta description. It’s not too long (under 160 characters), although I personally recommend trying to aim for 140. It’s not too short. The meta description has to provide enough information about the page. It’s engaging. Asking a question is a great way to engage with your audience. It’s not too technical. It’s important to keep it simple. I’ll finish this section by giving you an example of a perfect structure for your web page. I hope you will find these tips useful and will be able to use them to rock your SEO! If you have any questions or want to add something to the discussion, make sure to leave a message in the comment section below. Discover Part 2 of this SEO Guide.